Two cars parked on sidewalk in front of vacant commercial space (former auto-repair shop). Notified police using NYC 311 app and received a reply that they deemed police action to be unnecessary. The next morning, the cars are still there. This happens regularly on this block even though it is illegal to block the sidewalk. What can be done? Thank you for contacting Community Board 14 Office. Please feel free to call Brooklyn South Traffic Enforcement at 718-345-1800 Mon-Sat to report this issue. Hello - Please clarify the location of this photo so that we can attempt to address the condition. Is it on the West side of Parkside (towards Coney Island Avenue) at the Parade Ground or the East Side (towards Parade Place). Thank you for providing this additional information. It is on the west side of the Parade Ground in the middle of the path that connects Parkside to Caton. Just north of the flagpole. Thank you for this additional information. We are referring this to the Parks Department as the vehicles are parking within Parks Department jurisdiction. We will post more information as it is received. Thank you for contacting the parks department and making this a more official complaint. I know that the parks department is already aware of the issue and is as exasperated by it as the community. 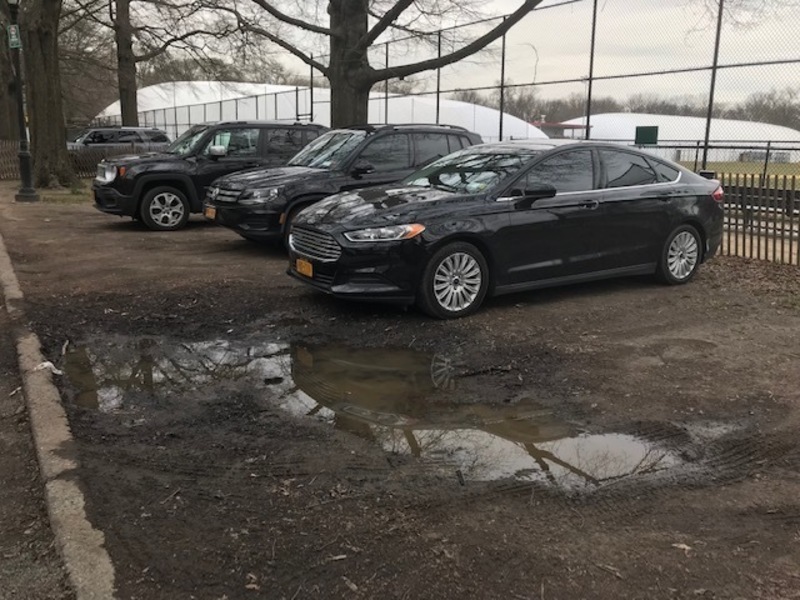 I would think it would also make sense to notify the police since they would be the ones that have the ability to ticket or tow these permitless, illegally parked vehicles and charge the owners of the vehicles that are destroying the park. There needs to be signage or a bike path where the parade ground bike path meets the Caton Ave sidewalk. Riders are spit right out onto a sidewalk with no information to walk their bike or where to go to connect to the bike path on Westminster or Argyle. Every 5 minutes people ride on the sidewalk here almost 24 hours a day. It is dangerous. Good morning - CB14 reached out to the Parks Department for more information. As soon as it is received, it will be posted here. Thank you. Community Board 14 requested signage to be installed upon exiting the Parade Ground bike path advising riders of the active sidewalk ahead with an instruction to Yield to Pedestrians. Thank you. This house has been abandoned and falling apart for at least 15 years. The city has had to come numerous times to exterminate vermin. It has also had to come remove the collapsing porch. The roof itself appears to be collapsing and that poses a danger. It attracts trash and is perpetually overgrown. Isn’t there anything we can do about this neighborhood eyesore? Uh, the word they bleeped out there was "@#$%". I believe that is the official term. Don't want people to think I was swearing at it! Community Board 14 is aware of this abandoned property and over the past several years we have worked with the City to see that is is inspected, violations are issued and to ensure that the house is not an immediate hazard. We reached out again to the Department of Buildings based on this complaint to see if any other steps can be taken by the City or if the house can be demolished, given its very poor condition. The DOB response will be posted here as soon as it is received. Thank you. Large pile of loose trash in front of business, blowing down the street. Even this address is within CB 14 borders, it's being serviced by BK 17 Sanitation Garage. So, please contact Community Board 17 at 718-434-3461 or bk17@cb.nyc.gov. Thank you. Hi, the white bus has sanitation markings from 1/10/19 but it is still on the corner by Midwood HS. no Plates. When does it get towed? The markings are on the right side of the bus. CB14 referred this matter to the Department of Sanitation and will post their response here when received. Thank you for the notification. Once again, a car is parked on the sidewalk in front of Dorlette Motors. This happens regularly in front of this business, prohibiting people with disabilities or children in strollers from passing. Please report all illegal parking conditions by first filing a complaint with 311. Next, please email the Service Request #, address and vehicle description to NYPD 70th Pct Community Affairs at 70PCTCommunityAffairs@nypd.org and cc: CB14 using email address info@cb14brooklyn.com. If you do not receive a response from NYPD within 72 hours, please email CB14 and we will follow up with Community Affairs. Please make sure to include the most recent Service Request #'s in all correspondence. Thank you. The construction site at 1702 Newkirk Avenue (southeast corner of Newkirk and E. 17th St.) constantly has work going on up to and after 9 PM. They also constantly dump styrofoam debris into the street and the front yard of the house next door. Thank you for contacting Community Board 14 Office. Please be advised that there are "After Hours Variance" permits issued by DOB, which permitting them to operate at the site from 6-9PM. If you observe work going on after 9pm, please report it to 311 and post you service request number (SRN) here. As far as DSNY issue goes, please, report it to 311 as well and provide us with SRN(s). Neighbors of the 402 & 410 Crooke Avenue Apartments have complained about speeding cars coming into Crooke Avenue from Ocean Avenue. There has been multiple car accidents due to speeding in this intersection through the years. The members of this avenue intersection would like to request a speed bump to minimize this erratic behavior by drivers in this area. Please contact out office at 718-859-6357. Thank you. Called 311 and they directed me to the Department of Transportation. The case number requesting a speed bump is DOT-399135-L2J6. We'll be following up on this request. After a serious accident at this corner, neighbors ask the DOT to install a stop sign at this corner for the safety of motorists and pedestrians. Sight lines from southbound E 18th are terrible for both pedestrians and vehicles! This is not an isolated incident. Near misses happen here not only daily, but by the minute. After this incident (which resulted in an injury and two vehicles hopping he curb onto a busy sidewalk during the AM school rush), NYCDOT should perform a warrant analysis for a stop sign on Newkirk or a traffic signal. DOT denied a a request for a stop sign at this location in 2015. Based on these community concerns and recent traffic collision data, CB14 will submit a new request for a stop sign at this location. The agency's response will be posted here once received. To follow up on this request, please contact Brooklyn Community Board 14 at 718-859-6357 and provide reference number DOT-378954-N4F3. Thank you. The speed at which vehicles plow down Newkirk, a stop sign is the minimum we need. We urgently request a traffic signal to give the many seniors and young children who live in our communities, the right to cross safely. To Mike’s point, cars parked on this intersection make it impossible to see oncoming cars or be seen without stepping out and risking an accident as happened this morning. Please don’t wait for another tragedy like our Park Slope neighbors have recently endured to take action.